Sociograms in NVivo can assist you in analyzing social networks by displaying them as a diagram—helping you to visualize connections. Use sociograms to perform social network analysis on a population of cases and their relationships, or on a Twitter dataset created from NCapture import. Sociograms are a graphic representation of the social links between people or other entities. 1 Vertex—represents a person, group or entity. In NVivo, vertices are cases (or Twitter users in a Twitter sociogram). 2 Edge—represents a connection or interaction between vertices. 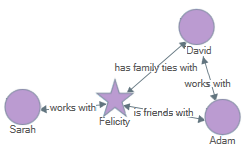 In NVivo, edges are relationships (or tweets and mentions in a Twitter sociogram). Edges can have arrow heads indicating the direction of the relationship. What can I use sociograms for? See all the cases connected to one particular case (the ego). In List View, select a case. On the Explore tab, in the Social Network Analysis group, click Egocentric Sociogram. 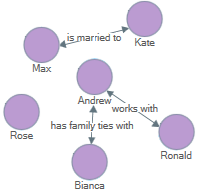 Visualize a group of cases to see how they are connected. This type of sociogram can include isolated cases. On the Explore tab, in the Social Network Analysis group, click Network Sociogram. See the network of your Twitter users, and how they are connected by retweets and mentions. Use NCapture to capture a Twitter dataset, then view the Twitter Sociogram tab in Detail View. The direction of an edge in a sociogram has meaning. NVivo sociograms are multiplex networks, meaning that different kinds of connections (edges) are shown on the one network. For example, Twitter sociograms show mentions and retweets; network sociograms show all types of relationships. How many people can this person reach directly? Which person is most likely to have the most information flowing through them? How fast can this person reach everyone in the network? Network metrics like density and reciprocity are used to calculate the level of connectedness for a network. You can view the scores of the centrality measures underlying the connections displayed in a sociogram in grid format. Degree centrality is the count of the number of vertices a vertex is directly connected to. Degree is often used as a measure of a vertex's degree of connectedness and consequently, their popularity and influence. This can be useful to determine which cases are pivotal to spreading information and influencing others in the network. For example, How many people can this person reach directly? Betweenness is how often the vertex lies on the shortest path between two other vertices. 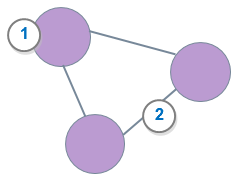 Betweenness shows which cases are communication paths between other cases which can be useful to determine points where the network would break apart. For example, Which person is most likely to have the most information flowing through them? It is important to understand that betweenness is defined differently from one social network analysis tool to another. NVivo usesSNAP and the Brandes(2001) algorithm to calculate betweenness centrality. In NVivo, the betweenness score is calculated as a proportion of the shortest paths. The shortest path is determined irrespective of the directionality of the links. Closeness is a measure of reach—the speed with which information can reach other cases from a given starting point. It can be an indicator of who has the easiest and quickest access to information in the network. For example, How fast can this person reach everyone in the network? To calculate closeness, NVivo uses the sum of the shortest distances from the specific vertex in question to every other vertex connected in the network. Any vertex not connected via any path is considered to have a distance from the specific vertex in question of zero. Therefore, closeness is only calculated amongst those vertices that are connected. The density score displays in the Status bar. Density is the count of vertex pairs that are connected in a diagram, divided by the total number of possible connections that could exist. The density score shows the level of connectedness in the network. In NVivo, edge weight and multiplicity aren't taken into account. The reciprocity score displays in the Status bar. Reciprocity is a measure only used for directed networks. It shows the percentage of edges in the network that are reciprocated. For example "Are there relationships in the opposite direction between the same people?" In NVivo, edge weight and multiplicity aren't taken into account. If there are two out-going edges and only one in-coming edge, it's equivalent to one edge in each direction—both being considered as reciprocated.